Experience the best of the Boston area by combining a tour of Cambridge, Lexington and Concord and a Boston trolley tour. 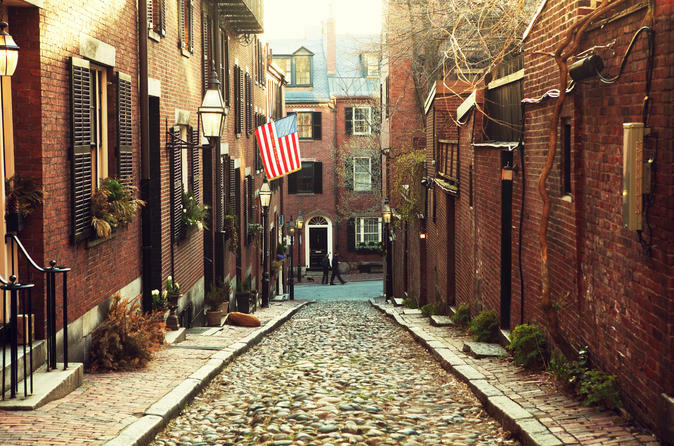 Delve into the history of the Revolutionary War and Civil War on a tour to three nearby Massachusetts cities, where you'll journey along the Battle Road Trail, follow the route Paul Revere took, stand on Lexington Battle Green, and view Harvard Yard and Cambridge Common, both US National Historic Landmarks. Boston Trolley Tour departs from 8 Park Plaza, Boston at 9:15am and 1:15pm. Enjoy the 3-hour loop on this fully narrated tour with picture stops at Copley Square, Fenway, and USS Constitution. Take the trip from Boston to Cambridge, Lexington and Concord on your first day, and then use your Boston trolley pass the following day. Boston Trolley Tour Trolley departs from City Place at 8 Park Plaza, Boston. Tours depart at 9:15am and 1:15pm. Sit back and relax on the full 3-hour loop, complete with live onboard narration and picture stops at Copley Square, Fenway and USS Constitution. Sites include the New England Aquarium, Faneuil Hall Marketplace, the Seaport District, the North End, the Site of the Boston Massacre, Beacon Hill, Copley Place and Rowes Wharf. Special Offer - Book this tour and save over 16% compared to booking each experience separately! - Book Now!